Tax problem resolution process, pricing, fees, cost, get reliable tax relief help. Only a licensed representative who has the specialized knowledge can resolve your tax problem, EA enrolled agent, CPA certified public accountant, Tax lawyer / attorney. Call us today at 1-877-78-TAXES [1-877-788-2937]. Back tax problem help: we help individual and business taxpayers with delinquent and unpaid back taxes, either 1040 personal taxes, 1120 business taxes, or 941 payroll taxes, we can negotiate the lowest settlement based on your financial situation and resolve your stressful tax matter through small monthly payment plans or lump sum settlement. We can release your wage garnishment, bank levy and tax lien. IRS & State tax audit help: we represent individual and business taxpayers facing federal and or state tax audits such as IRS, FTB, BOE and EDD tax audits and examinations. Taxpayers will not attend or face the auditors, we fully represent you and conduct an audit readiness at our office, help you organize your supporting documents, reconstruct records and fully represent you before the tax agency. Unfiled tax returns: you are not alone, there are millions of non filers, and we can help you. We get a power of attorney to represent you, this way you do not have to talk to the IRS or the state, we obtain all your prior years’ tax documents such as W2’s, 1099’s etc, we further help you organize your tax matters with our tax organizer, then prepare and file your delinquent tax returns and also negotiate a resolution for nay balance you might owe. We can release your wage garnishment, bank levy and tax lien. What are you waiting for? Get peace of mind today! Call now 1-877-78-TAXES [1-877-788-2937]. 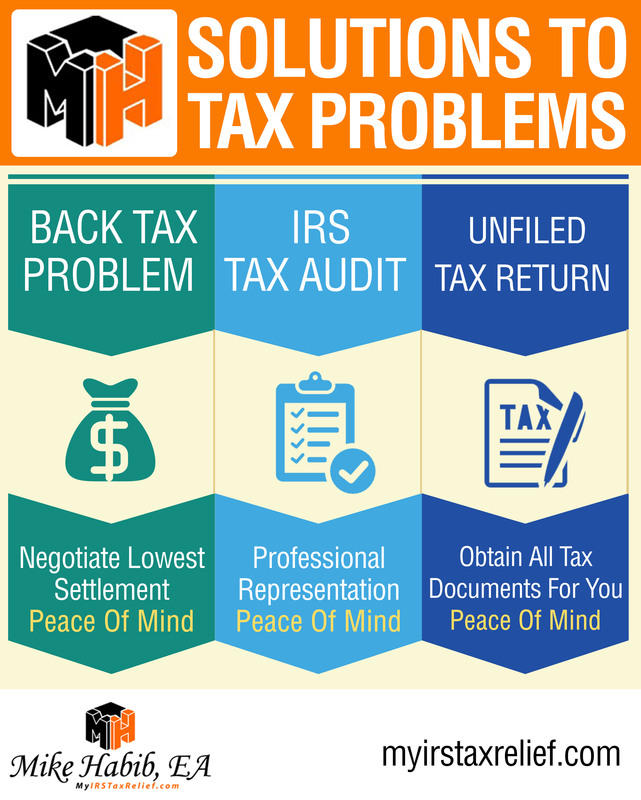 We have solutions to your particular tax problem. Mike Habib is an IRS licensed Enrolled Agent who owns and operates a specialized tax service boutique firm serving clients with back taxes, tax audit or unfiled tax returns in various metro areas such as Los Angeles, Whittier, Pasadena, Glendale, Burbank, Orange County, Riverside, Palm Springs, San Bernardino, Palmdale, Bakersfield, New York, New Jersey, Chicago, Houston, Phoenix, Philadelphia, San Antonio, San Diego, Dallas, San Jose, Detroit, Jacksonville, Indianapolis, San Francisco, Columbus, Austin, Memphis, Fort Worth, Baltimore, Charlotte, El Paso, Boston, Seattle, Washington DC, Milwaukee, Denver, Louisville, Jefferson, Las Vegas, Reno, Hempstead, Tucson, Nashville, Davidson, Portland, Tucson, Albuquerque, Santa Fe, Anchorage, Atlanta, Long Beach, Fresno, Sacramento, Mesa, Kansas City, Cleveland, Virginia Beach, Omaha, Miami, Oakland, Tulsa, Honolulu, Minneapolis, Pittsburgh, Colorado Springs, Arlington, Wichita, Birmingham, Montgomery, Tampa, Orlando. Tax representation, tax planning and preparation service help for clients throughout Southern California including Norwalk, Santa Fe Springs, Downey, Pico Rivera, Montebello, Hacienda Heights, La Habra Heights, West Covina, La Habra, Brea, Fullerton, Yorba Linda, Cerritos, La Mirada, Lakewood, Anaheim, Santa Ana, Long Beach, Compton, Torrance, Los Angeles, Pasadena, Beverly Hills, Santa Monica and throughout Los Angeles County, Newport Beach, Irvine, Orange County, Corona, San Bernardino County, Riverside County, the Inland Empire, the San Fernando Valley and the San Gabriel Valley.